Not as pretty as most of the rigs here, but it's functional. (I love that huge res.... did wonders for keeping the microbubbles out of the loop... :) ). 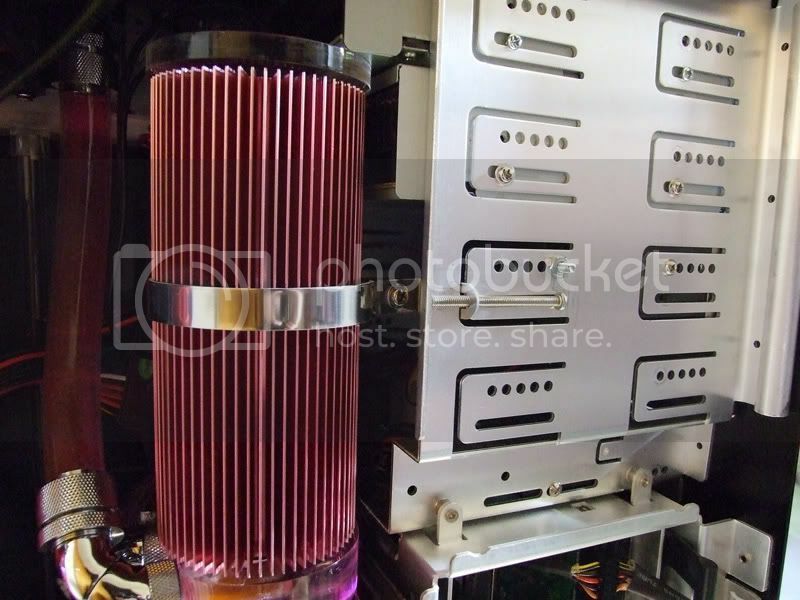 If you put a fan over that passive res, will it lower your temps by much? I doubt it very much. The surface area of water that's in contact with the res sides is pretty small compared to the surface area inside the rad. Once the loop is broken in I'll give it a try though to see. See the Screw and Bolt that's the Spot Fan minus the blue leds (I snipped off the LED lights carefully)mounted inside the 2x 5 1/4" bay that my IMON Ultra Bay is in. Pretty much hollow in there so I wired in the "Antec" Spot fan on "HIGH" to my AeroCool Easywatch which will auto regulate any fan you connect to it by using the Temp Sensors of the Easywatch. So I put the CASE temp sensor on the upper back side on my Pink Res...and the Antec Spot Fan behind blowing on it below the sensor! AeroCool does the rest... At idle the Fan is 2400 rpm or 25C on load it goes up to 2700 rmp to about 30C. Here is my antec 900 loop I just finished.